Traditional wedding loaf long been considereda symbol of fertility, a large family happiness, but also means a transition from a carefree bachelor life in a family full of responsibilities. 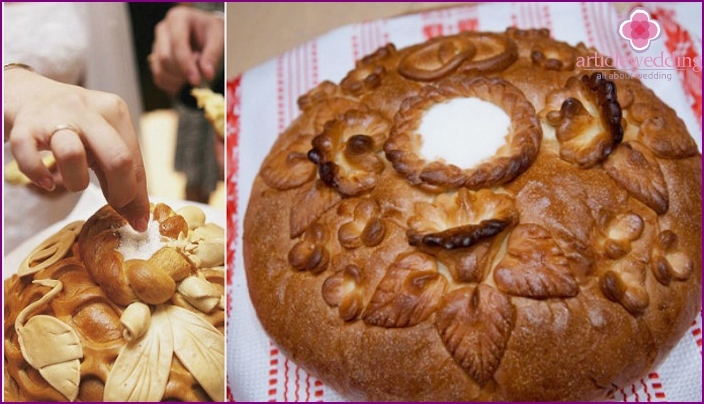 Ranshesvadebny loaf their rukamidolzhny were prepared by experienced married women who are happily married. Not admitted to the case of widows, divorced or childless, to their fate was not able to influence the future life together newlyweds. A suitable day for the holiday bakingloaf considered Saturday. In this day of the trial participants bring everything you need in the house, where the held concomitant preparation rituals. 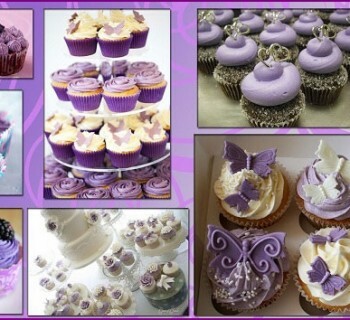 Now the wedding held at the end of the week, and in the middle, and custom pechsvadebny loaf came out of his rukamipochti articles, replaced by products ordered in a candy store. However, the real housewife, cousin of the future spouses, will surely be happy to present them a gift - homemade loaf. It should be remembered that take, the moreloaf - the happier the marriage will be young, so for karavaynitsy capabilities can increase the amount of ingredients to make the product their own hands anymore. In ancient times, a loaf could weigh so much that it barely carried by several people. Pour the warmed glass of milk (or water) in the bowl - the milk should not be too hot, just warm. Add a spoonful of sugar, gently mix thoroughly. Slowly sift cup flour through a sieve. The resulting consistency of the dough should resemble oladevoe. Top sprinkle the resulting brew smallthe amount of flour, cover with a cloth or towel and leave for an hour and a half. Remove when it rises as much as possible. If this is not done in time, can appear unsightly cracks. 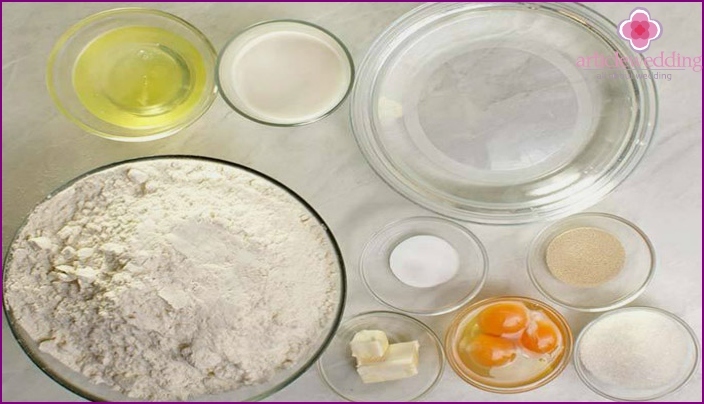 Separate the yolks from the whites of eggs, one egg yolk aside to lubricate the product before baking. Mash yolks with the remaining sugar, add the resulting mixture to the risen sponge. Put half a cup of flour, pour the rest into a large bowl or pan. Melt butter or prepare a vegetable. Make a recess in the flour, pour in to the brew with the yolks, oil, protein, sprinkle salt. 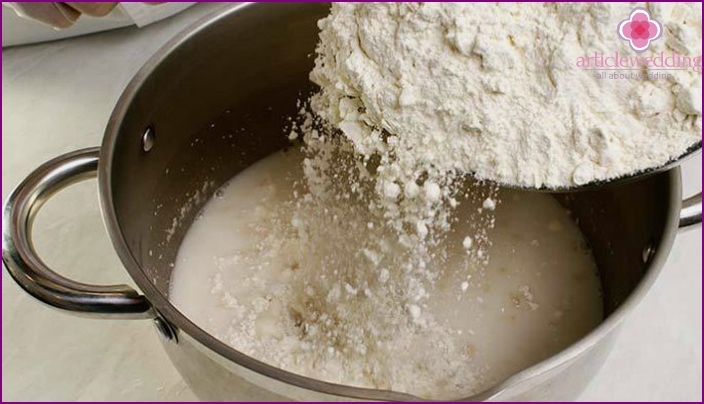 Well knead the dough, adding flour deferred until it is no longer stick to hands and will not be smooth - this activity will take you up to an hour. When everything is ready, to shift weight in the dishes, leave the dough in a warm place for two hours. Then it must be obmyat, to come again. Separate from the dough 500-600 grams - it will need for future jewelry. Form the remainder of the mass of the ball. Cover the baking parchment, put the ball gently moisten with water. Think and make decorations for the loaf with the help of 500-600 grams, had been delayed. While making ornaments with their hands, preheat the oven to 200 degrees. Do not forget to constantly wet the decorations and the next loaf, so they do not dry out. Loaf certainly will increase in size untilpreparing decorations, it's okay. When decorating process is finished, mix the egg yolk, previously deferred, with a tablespoon of water, well lubricate the surface of the platter, that she was beautiful and rosy. Cover the dish with foil, reduce the temperature to 180 degrees when the surface is golden. After this loaf is baked for an hour or a little longer. Important note: when a loaf in the oven, it is impossible to plow, checking availability. If it comes a lot of heat, the product can osest.Kogda wedding loaf will be fully ready, it is necessary to cool the dish for 15-20 minutes, opening the oven door. Slightly cooled down product is put on the laid napkin prepared dish, brush with butter or surface water, spreading it in sugar. The top also have to cover with paper towels, and then a towel. As such, the need to keep the wedding a loaf at night to the "rest". 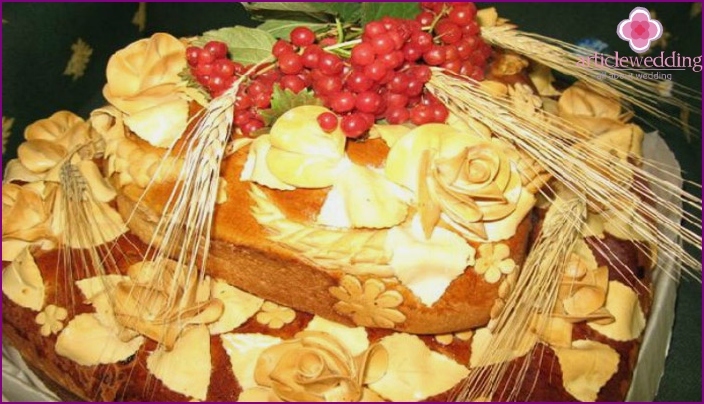 Particular attention should be paid to the decoration of the wedding a loaf, as all the details of decoration of this dish are a definite meaning. There are two ways of decoration products with their own hands. The first - before you put it in the oven (as described above). However, in this case, it is likely that the decorative elements become blurred. Another option - made of dough ornaments stick loaf for 10-15 minutes before you need to get out of the oven. This ensures precise shape parts. Clusters of viburnum - a must forWedding culinary dishes. It is a symbol of love, fertility. To make the dressing, roll thick balls cut in half, attach the hemisphere to the surface, forming a branch of viburnum. Braid. 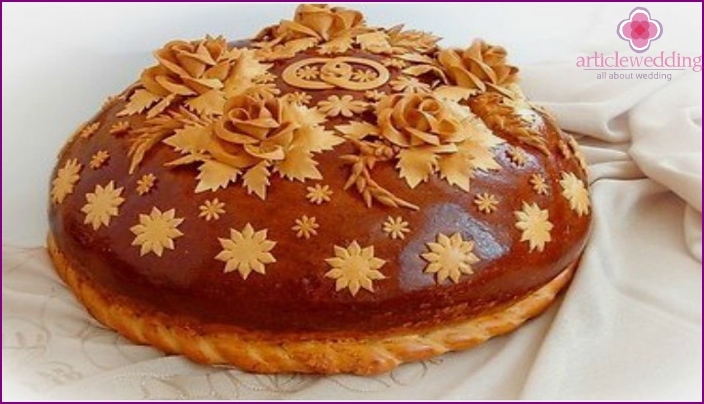 Traditionally, this element try to decorate all the loaves, having braid along the edge of a spherical product. It symbolizes the sun. 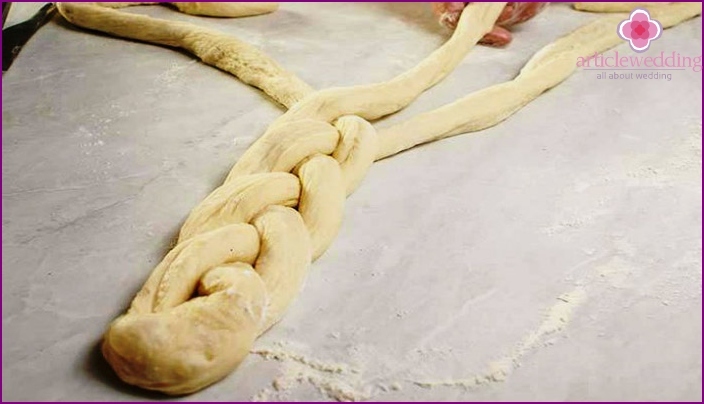 To prepare the braid with your hands, you need to sculpt dough 3 long tow (both 2.5 circumference of the wedding a loaf), connect one end, then braid around consolidate skewer. Spikelets of wheat - a symbol of fertility. For the preparation of ears with your hands necessary to form a test harness, one end of which is narrow, the other - wide. Then, attach the harness to the wedding loaf, thick edge on all sides "to pinch" scissors, forming ears of grain. Roses. 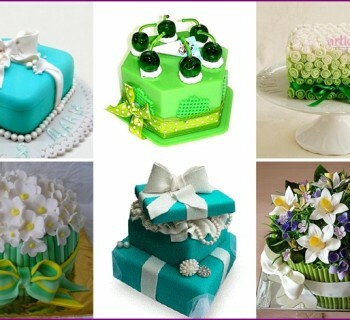 Denotes love, the rose will be a wonderful decoration of the wedding a loaf. For the manufacture of roll three or four thin circle. First, take a roll, wrap the next round, slightly bending the edges. Likewise, the third bending edge more. The output will turn a beautiful finery. Leaves symbolize youth, abundance. To create this part of the wedding decorations the loaf, cut diamond of the test weight, and the edges notch teeth. Veins take a knife, cut out small pieces of dough. Deepening salt. As a rule, during the baking dish in the affairs of the recess tsentrevaya decorating her braids, leaves, ears. Then to put salt. 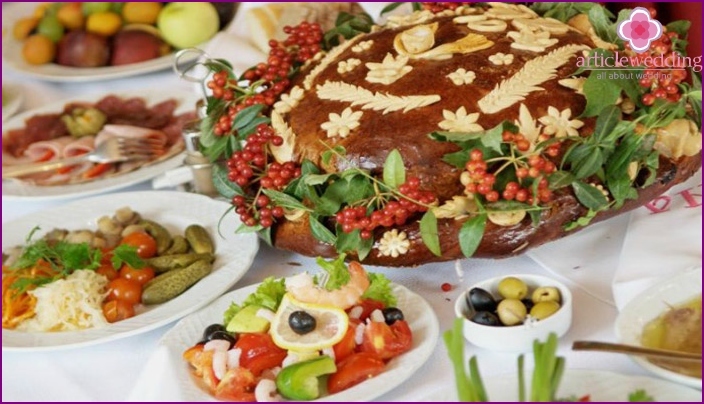 When the newlyweds will make a loaf, they will have to break off a piece and then obmoknut in salt and eat - this ritual symbolizes eaten a peck of salt together, and heralds further sweet life. 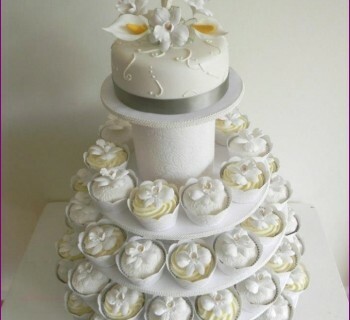 Another interesting tip for those who do not know what to do with the wedding loaf: ready to decorate dishes were contrasting in color, do not grease before baking the resulting decor yolk. 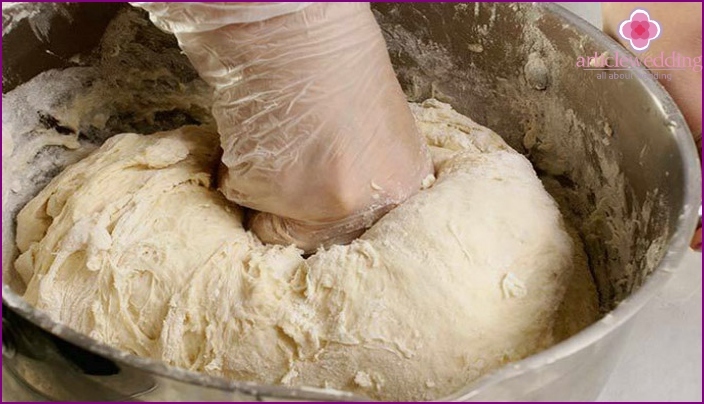 Making wedding loaf with your handsBusy, where you want to put all your soul. Oven wedding meal need to love, and even better - with prayer. Master class on cooking this dish is to help home cooks do newlyweds holiday even better. 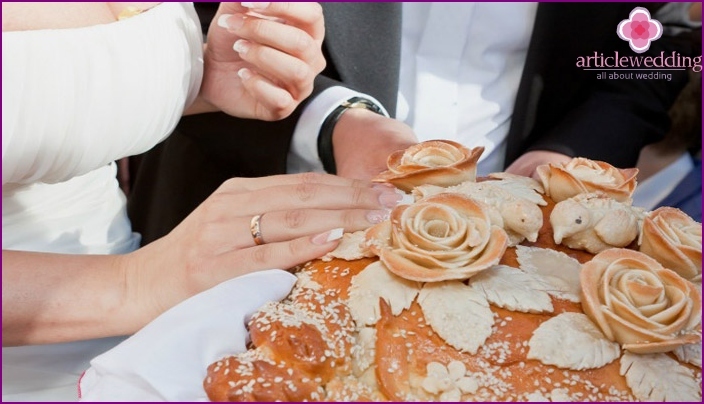 The ritual cutting of the loaf and a treat will be a wonderful decoration of photos and video from the wedding day.